Since the November election, Muslims, immigrants, women, Black communities, and members of the Lesbian, Gay, Bisexual, Transgender, and Queer (LGBTQ) community are increasingly becoming targets of hateful intimidation and harassment. These incidents have taken place on public transportation, out in the street, in places of worship—but the majority have taken place in our K-12 schools and college campuses. These attacks are happening to our communities, to our friends, and loved ones. In recent weeks, actions by the new Administration have specifically targeted these same communities with Executive Orders. During his first 11 days in office, President Trump signed 18 Executive Orders, including one to ban the entry of people from Iraq, Iran, Sudan, Libya, Yemen, Somalia, and Syria for 90 days, an order to build a wall between the US and Mexico, and an order to increase deportation of undocumented immigrants. 70 percent of students reported witnessing bullying, hate messages or harassment during or since the 2016 election. One survey found 55 percent of Muslim students reported experiencing some form of bullying related to their religious identity. 29 percent of girls who wear a hijab—the traditional Muslim head scarf—said they had been offensively touched by another student. 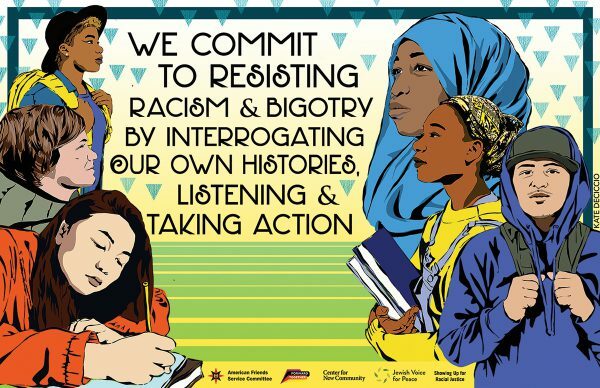 Prompted by a desire to create space for discussion in schools, artists Micah Bazant and Kate DeCiccio partnered with American Friends Service Committee, Forward Together, Jewish Voice for Peace, Center for New Community, and Showing Up for Racial Justice to produce the poster insert in this magazine and the graphic above. In addition to the images, a crowdsourced discussion guide was created by volunteers to help educators use the posters to open discussion in the classroom. This material assumes that conversations about our differences and similarities is a normal part of the classroom. As with all conversations in this vein, it's important not to put any student on the spot during discussions to speak for or on behalf of their community. For example, asking Muslim students to answer questions in class about their faith or ways of worship can result in Muslim students and their families feeling even more alienated and under scrutiny. Teachers can create opportunities for every student to learn without placing the burden on individual students because of their race, culture, religious backgrounds or other identities. Adapt the exercises based on your deep knowledge of what will work in your class- room, with the students you teach. The goal in creating these activities was to provide educators with age-appropriate questions for discussion to accompany the artwork. Your experience in the classroom and understanding of how to tie the activities to con- tent you have already covered are a critical part of success in these conversations. Forward Together works in Oregon and nationally to change culture and policy so that all families can thrive. They focus on race, sexuality, gender and immigration status, ensuring that all people have the rights, recognition, and resources they need. To get involved, email Sami@forwardtogether.org or sign up for our mailing list at www.forwardtogether.org. An Executive Order (EO) is an official statement from the president about how the federal agencies function. EOs usually change a current practice or policy. Some famous Executive Orders include the Emancipation Proclamation (Abraham Lincoln), sending federal troops to integrate schools in Little Rock, Arkansas (Dwight Eisenhower), and the internment of Japanese Americans (Franklin Roosevelt).